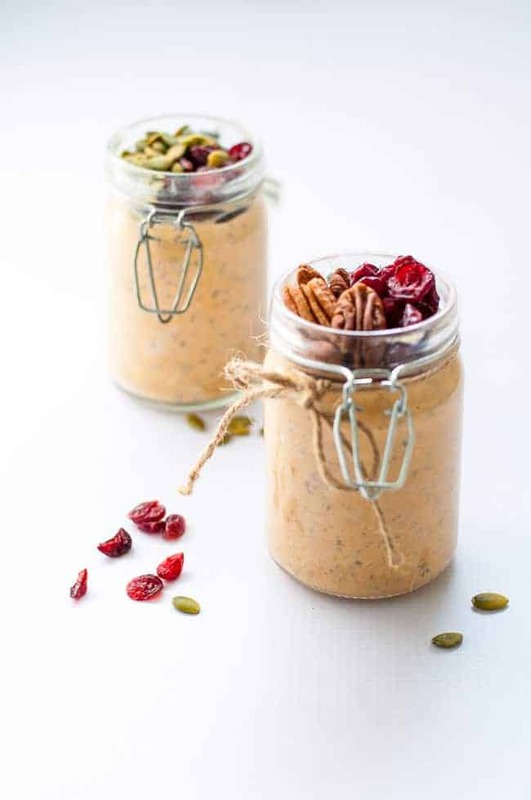 These Creamy Pumpkin Pie Overnight Oats made with warm fall spices and chia seeds make a healthy breakfast to wake up to. Easily made vegan and gluten-free. 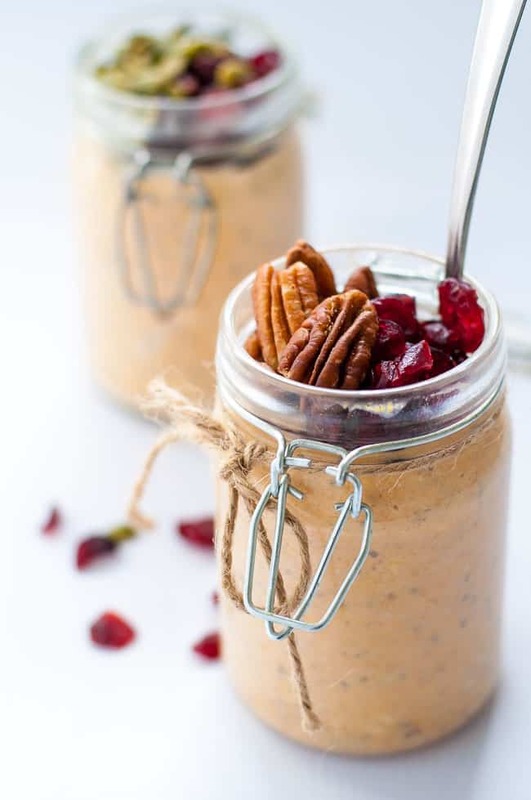 This little jar of pumpkin pie overnight oats is full of fall flavours to savour: pumpkin, cinnamon, pecans, and cranberries. 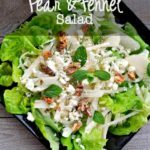 It’s creamy, delicately sweet, and has that necessary crunch we crave from added nuts and dried fruit. I added pecans and cranberries to one jar and pumpkin seeds to another and both were delicious. Have you settled into fall schedules now? Even though I’m not returning to work, fall just seems to demand a sense of order and organization. Those lazy days and late summer nights have ended and I’m embracing new projects and new routines. 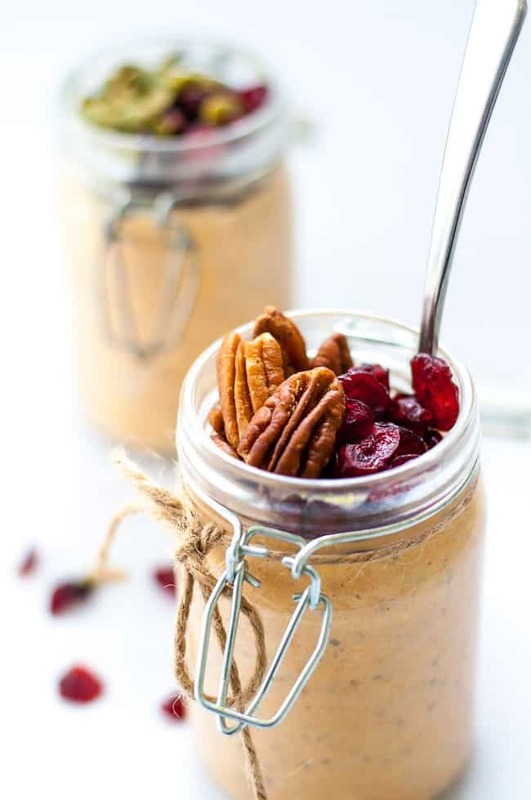 But one thing never changes in our home — starting the day with a healthy, protein-packed breakfast like these Creamy Pumpkin Pie Overnight Oats. Sometimes I love to experiment and try different flavours of overnight oats, or use whatever is in season, like these summertime Peach and Blueberry Overnight Oats. But this week, I opted for autumn flavours, because what symbolizes fall more than pumpkin? they’re convenient. Make a jar the night before (or make enough for a few days) and head to bed knowing that your breakfast will be ready and waiting for you in the morning. Take time to sit and simply enjoy these creamy fall flavours, or grab it and go, eating later when you have time. they’ll keep you full and satisfied. Eating complex carbohydrates and protein in the morning helps you avoid spikes in your blood sugar. Oats are a good source of soluble fiber and take longer to digest, making you feel full. adding chia seeds makes them even more nutritious. Chia seeds are an excellent source of fiber, protein, Omega-3 fatty acids and other micronutrients and are full of anti-oxidants. they are quick to make the night before. You can head to bed knowing that your healthy breakfast will be working its magic in the fridge while you sleep. 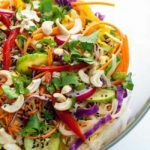 You can easily make this recipe vegan and gluten-free. Substitute coconut milk or almond milk yogurt for the traditional Greek yogurt and use certified gluten-free oats, if necessary. 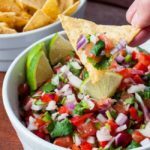 Simply mix all ingredients together in a medium bowl, stir to combine and spoon into small, serving-size jars. Cover and refrigerate. In the morning, add toppings of your choice, like pecans, walnuts, dried fruit, diced apples or chopped pears. I eat these cold, straight from the fridge, but on chilly mornings, you might like them quickly warmed in the microwave. I hope you get a chance to make these. They’re just that good! 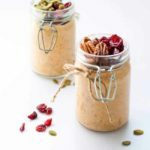 These Creamy Pumpkin Pie Overnight Oats made with warm fall spices make a healthy breakfast to wake up to. 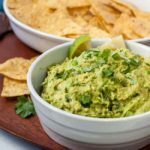 It's easy to make this recipe vegan and gluten-free. Toppings: walnuts and dried cranberries or other nuts seeds or dried fruit of your choice. Combine all ingredients in a medium bowl. Stir well and spoon into 8 ounce jars. Leave room at the top for add-ons in the morning. Seal and refrigerate overnight. This recipe makes two servings. Would you recommend halving this recipe for one person or would it be fine for a second serving the day after? It’s great the second day . . . and the third, and even the fourth! If you want to add keep the nuts really crunchy, just add them in the morning, although I found they only softened a tiny bit after four days. Thanks! I’m all on board with grab and go breakfasts, especially when they’re make ahead like this one! They’re been literally life changing for me since I finally eat breakfast and have better energy now! Thanks Kari! Perfect for hectic mornings???? I haven’t tried overnight oatmeal yet, but I guess it’s time! 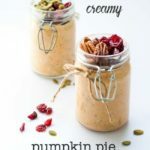 The pecans and cranberries with pumpkin must give it a very nice twist. I’m not a fan of that plain old pumpkin pie filling from the can either! I’m definitely pinning this to try. I have never made overnight oats before. 🙂 I should try yours 😀 atleast! Thanks Cathy! It’s made me a pumpkin convert! I have been meaning to try overnight oats for a while now! It’s outstanding???? They’re so easy . . . and so convenient for busy mornings. I saw this recipe on here the other day and couldn’t stop thinking about it! Last night at my daughter’s dance were talking about how it’s just that time of year where you need to make pumpkin stuff and I mentioned seeing this recipe! Everyone drooled…Officially PINNED now so I don’t forget! Hi Terry, Thanks for your kind comment, and thanks so much for sharing it on Pinterest! Hope you get a chance to make it soon. I love these pretty, bright photos! 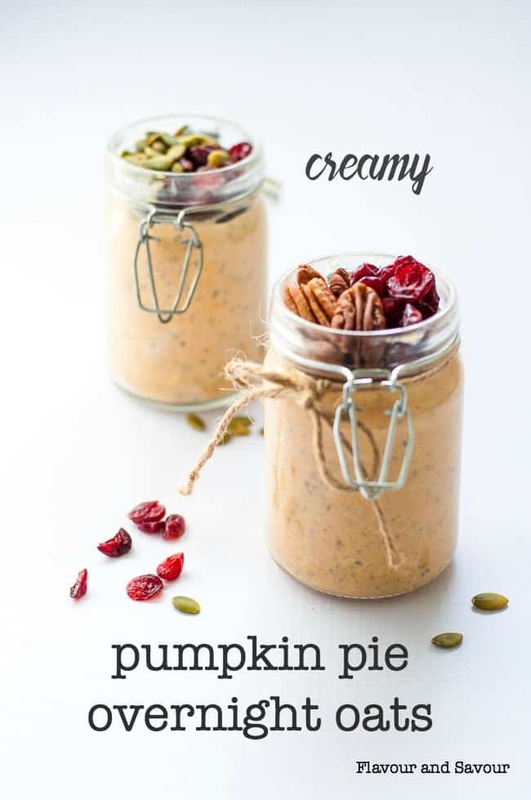 I’ve never thought of adding pumpkin to my overnight oats but this looks so delicious, and perfect for this warm fall weather we’ve been having. It’s also a great way to use up those little bits of pumpkin left over from other recipes, too!